Innovative design, high-quality equipment and a level of customer service that people rarely experience is truly the core of Illuminations USA. We are the premier provider of landscape and outdoor architectural lighting design works in Saint Cloud, Winter Park and the greater Orlando region of in Florida. When you hire us to design a new lighting system and install new fixtures around your property, you can expect the final result to highlight the beauty and style of the building’s exterior. In addition to enhancing the visual aesthetics of your entire property, our landscaping lighting will serve as a much needed security deterrent to unwanted guests and criminals. No matter what the size job is or what will best meet your lighting needs, we will go above and beyond to ensure that each and every one of our clients are completely satisfied. Architectural and landscape lighting can be an extremely difficult and even dangerous job for homeowners to complete themselves. We are fully insured and licensed low-voltage lighting professionals who have the experience and knowledge to ensure that every light is properly placed and installed to function at its full potential while remaining safe at all times. If you try to tackle the job without any help, you may simply end up wasting time and losing money. When done right, an architectural lighting project can benefit your home for years and even decades to come. It’s worth hiring our team to ensure the job gets done correctly from the beginning. As a homeowner, there are few things worse than feeling like you can only enjoy the outside of your home during the day. If you’re busy at work most hours that the sun is up, this severely limits the amount of time you will be able to spend in and around your yard, patio, pool or other areas around your home. Let us give you the same access and great visibility at night that you experience during the day. Our unique landscape lighting designs can properly light your yard and give you the ability to enjoy the outdoors at your leisure without disturbing your neighbors. We also provide the best pool area lighting, allowing you to have late-night dips in the pool or all night pool parties. Stop letting sunsets and the night determine where and when you spend your time in and outside of your home; let our team here at Illuminations USA open up new opportunities. 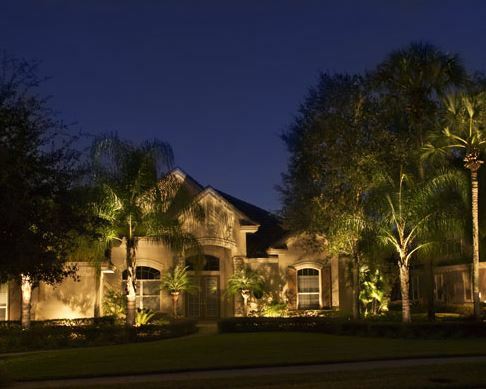 Since 1994, we have been the innovators and industry leaders in landscape lighting, architectural lighting, security lighting and LED lighting in the Saint Cloud and the Orlando metro area. We will stop at nothing to turn our clients’ visions into reality and make sure that their property is properly represented at all times of the day. In fact, we have been the recipient of several notable awards throughout the years that highlight the work we’ve done. We don’t leave a job unfinished or a homeowner unsatisfied with the finished results. No matter what type of lighting you need for your home, you can expect us to exceed expectations. Call us today and see how we can put the “appeal” in “curb appeal.” Browse through our website to learn more about us and see some of the architectural lighting services that we’ve provided to homeowners throughout the Central Florida area. For more information on what we can do for you or to discuss your lighting idea, contact the Illuminations USA team today! All project photographs shown on this website and in our brochures were designed and installed by Illuminations USA and are copyright of Illuminations USA and our photographer Gary Davids – www.abbaphotography.com. All fixture photos are copyright of Kichler Lighting and are used with permission from the manufacturer. We will always be prompt for our appointments. We will respect your home and your privacy. We will arrive prepared to work. Click here to see frequently asked questions about the design and installation of landscape lighting. Click here to read testimonials from the clientele we have been serving for over 13 years.